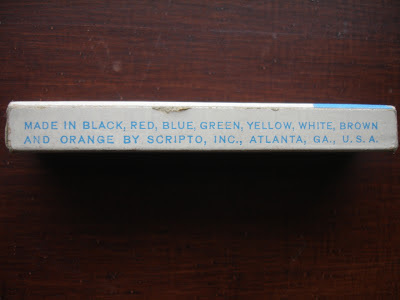 It seems that we have come a long way in the labeling of lead for mechanical pencils. Some of the vintage leads I have been collecting for my vintage pencils have been a little puzzling. 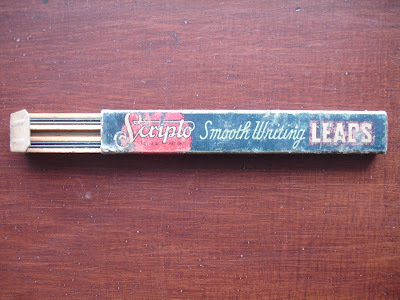 This Scripto package appears to be the oldest, and there is no mention of the size of the lead at all. Inside it is 1.1 mm. This was before 0.9 mm was even invented, far less anything thinner. "Smooth Writing," though. And available in 10 degrees of black plus 17 colors! 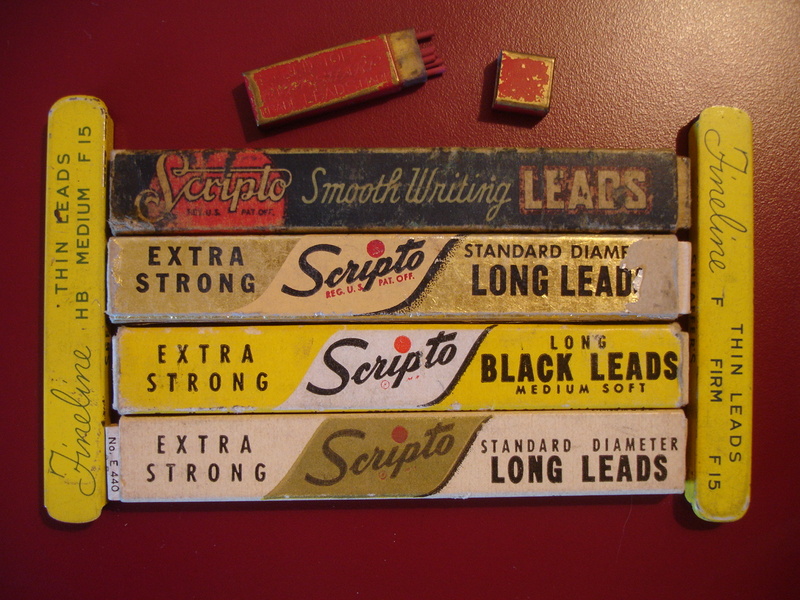 Next is a newer Scripto box with "Standard Diameter" leads. On the side of the box it says that Standard Diameter is .046 inch. 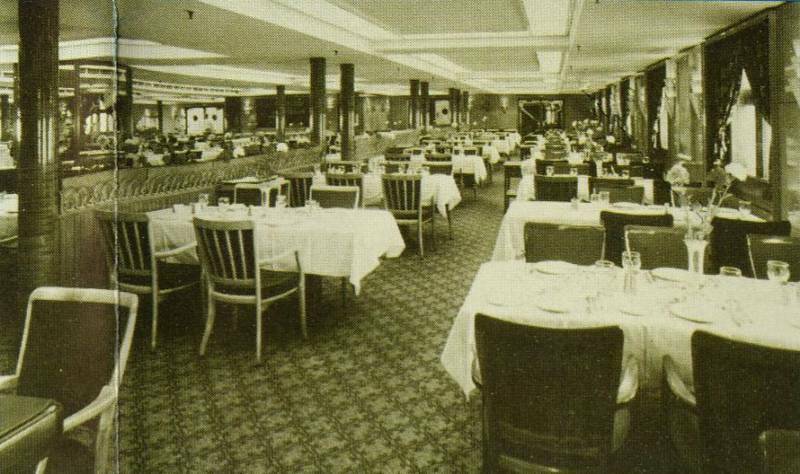 The wooden trays of both are enclosed in cardboard covers that slide. This is approximately 1.1 mm lead, actually 1.17 mm. 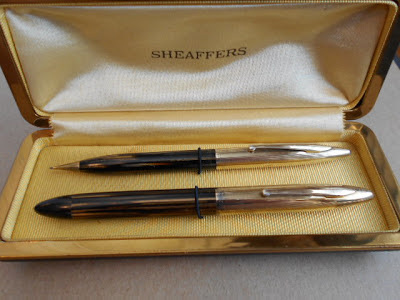 This is Sheaffer 1.1 mm lead in a small metal case. 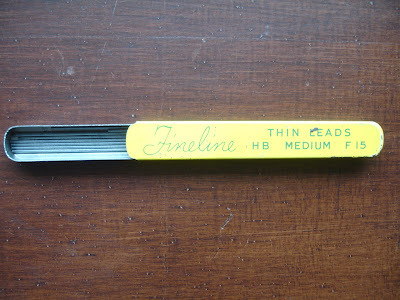 And this metal slide-open yellow and blue box holds "Thin Leads" made by Sheaffer for their "Fineline" pencils. This thin lead is 0.9 mm. Come to find out this size is now called thick lead! 0.3 and 0.5 are now the thinnest leads. 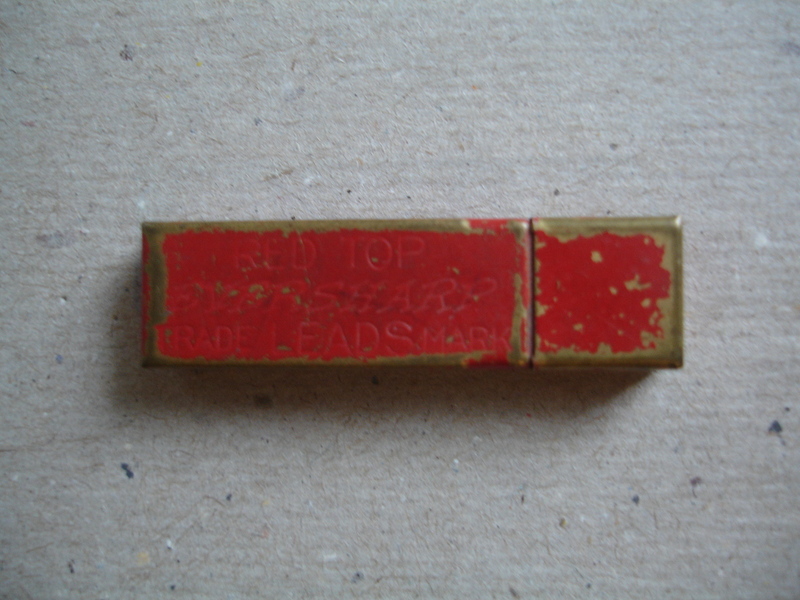 This is a later box of Sheaffer leads is the same size, 0.9 mm. It has a clear plastic tray and a sliding metal top. 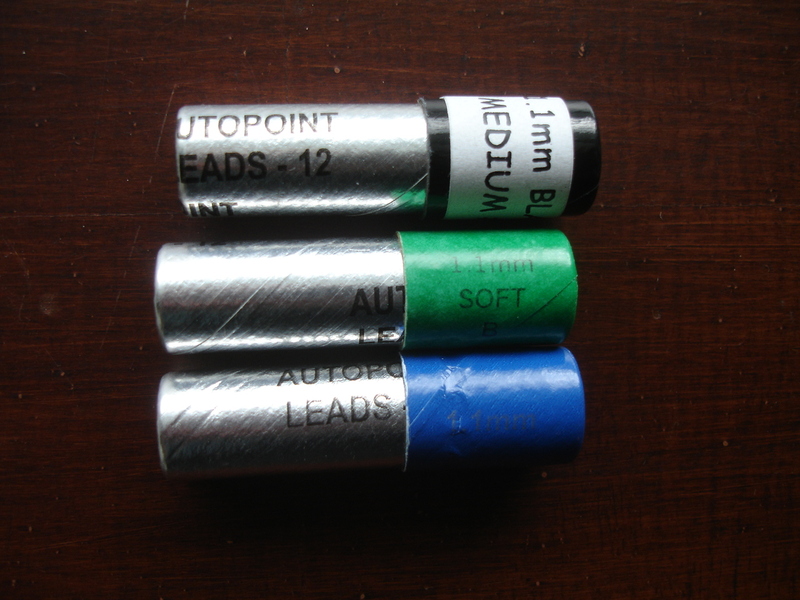 The Autopoint Company obligingly still provides thick lead, 1.1 mm, in black, red, green and blue. The blue, green, and red are soft, while the black is medium (HB). It comes in these spiffy silver cardboard tubes. Scripto made lots of colors. One box of "Thick Lead" (and this time it is .120 inch, or 3 mm) says this thickness was. . . I received this wooden container of lead in the mail today, it looks brand new and has never been opened. 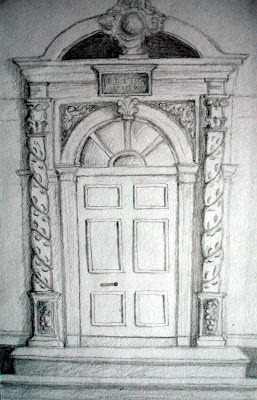 It was made by A.W. Faber of Newark, New Jersey. 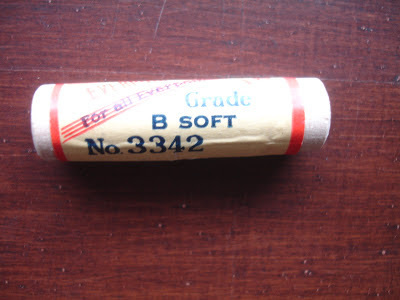 It is soft (B), and until I open it, I will have to take the word of the seller that it is 1.1 mm. It's so perfect, I kinda hate to open it! Pentel makes a nice selection of leads for their currently available models. 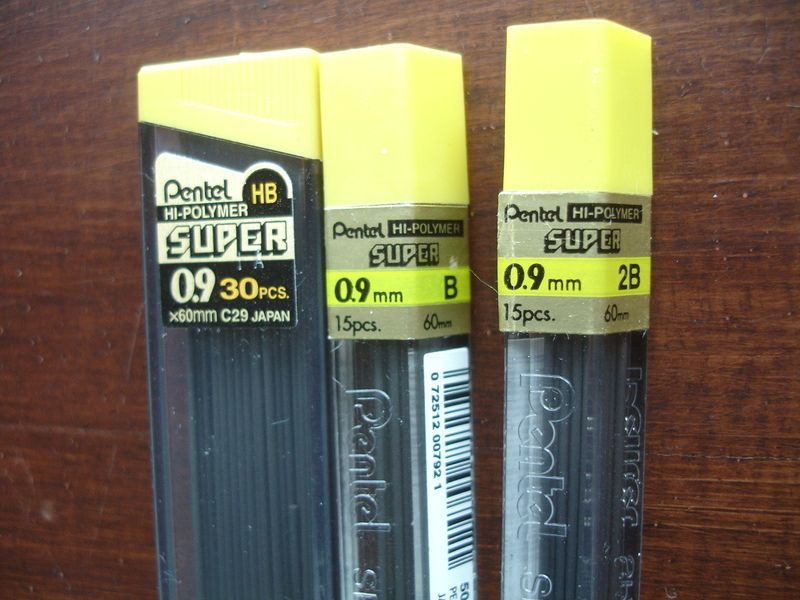 I was able to buy three grades of 0.9 mm lead to go in my post-1938 mechanical pencils: HB, B, and 2B. That's medium, soft, and soft times 2. I found this right next to some serious-looking black Pentels and some neon-colored, glitter-plastic Pentels. 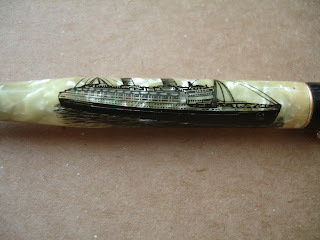 They can't hold a candle to the vintage pencils, but I do like the Pentel Clic Eraser. Someone was watching pencil erasers being extruded from the machine one day and thought, Why cut them up? Why not just sell one looooooong eraser? Great idea, Someone! 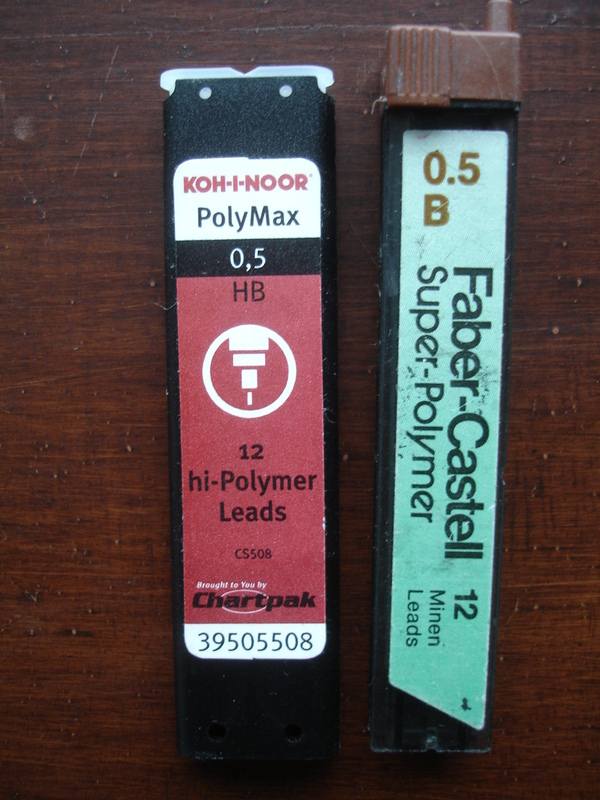 Before my conversion to vintage pencils, I found this polymer lead from two long-time pencil makers in Germany to be nice for my really thin lead pencils. 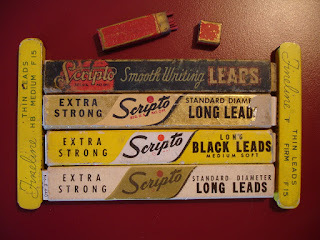 One thing that was included on the old packages that you don't find today is this, on the back of the earliest Scripto lead box: How to put the lead in the pencil! This little 4" ring top pencil was rattling around in the family junk drawer; I couldn't decide quite what it was meant to be. It didn't have a ring, so I put a jewelry jump ring through the hole in the top. It looked contemporary, that is, contemporary to me (read that as "vintage"), and it worked just fine, too, but it seemed lost and forlorn. FOR SALE PAT PENCIL. IT DOES WORK AND HAS A BUILT IN RETRACTABLE CHAIN. I BELIEVE THIS IS FOR NURSES OR DOCTERS BUT CAN BE USED IN OTHER AREAS OF WORK. VINTAGE ITEM. SAYS ON THE BACK of THE PIN: KETCHAM & MCDOUGALL. DIRECTIONS FOR USE: FASTEN YOUR PAT PENCIL TO YOUR CLOTHING WITH THE PIN POINTING DOWN, NEVER CROSSWISE. TO OPERATE, PULL OUT THE CHAIN AND LET IT RETRACT SLOWLY UNTIL IT CATCHES. 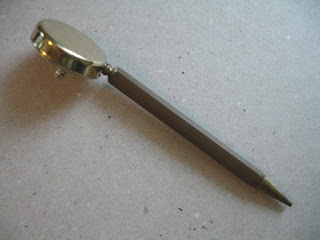 TO REWIND, PULL OUT THE CHAIN AND ALLOW IT TO RETRACT QUICKLY (JUST LIKE A WINDOW SHADE) TO REFILL THE PENCIL, TURN THE POINT IN THE OPPOSITE DIRECTION AT LEAST 3 FULL TURNS. INSERT NEW LEAD AND PRESS INTO THE CLUTCH. FOR ERASER AND EXTRA LEADS UNSCREW CAP. CONDITION: USED WITH NORMAL WEAR BUT LOOKS BRAND NEW. BOX HAS SCUFF MARKS. The unloseable PAT pencil! Now that I had a name I could look for others, and I found a black one, too. 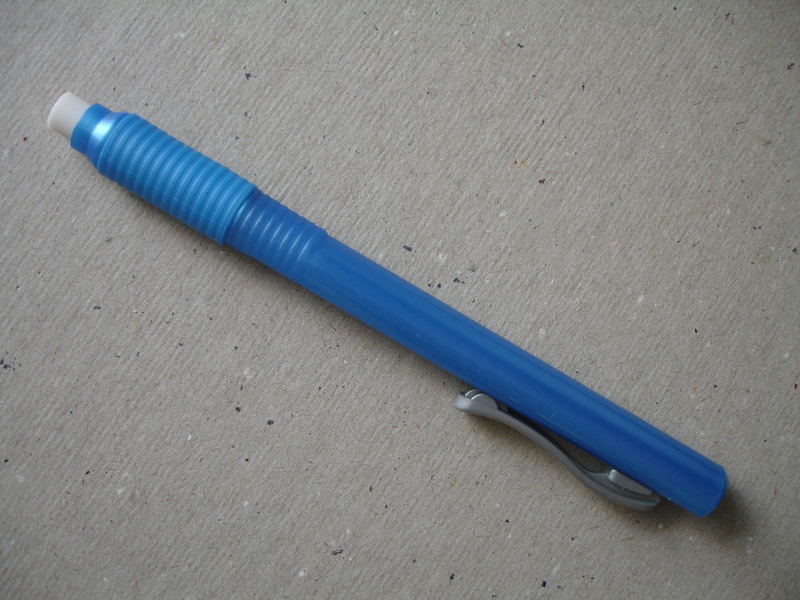 Pin-on pencils have no doubt been around for a long time. 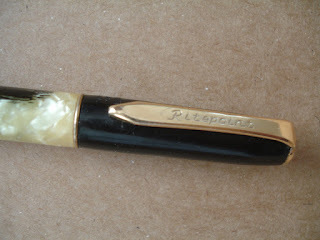 There was one made of brass and brown celluloid in my great aunt's things, unmarked by any maker's name. 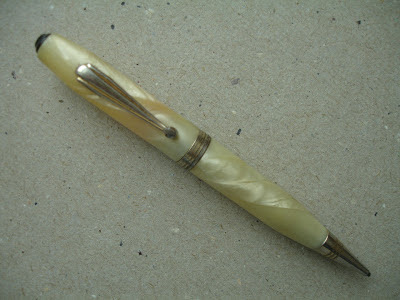 Unlike PAT, it has no place for a ring in the top, the wound-up brown cord goes directly into the pencil. You can see that it winds around a little wheel inside the round case with the pin on the back. 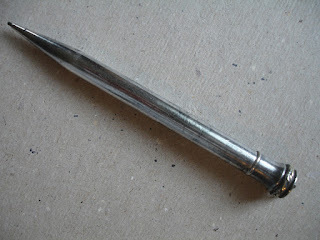 But when a pin-on pencil loses its pin, is it still a pin-on pencil? And how did an "unloseable pencil" get lost? There must have been a weak link somewhere in that retractable chain. 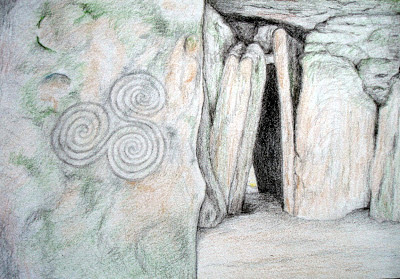 It's the English translation of an Irish jig tune called Tabhair aire do na Mná, and it's the name of a phenomenal Celtic music band with only women members, but I had the idea that this thought might also have been in the minds of mechanical pencil-makers. 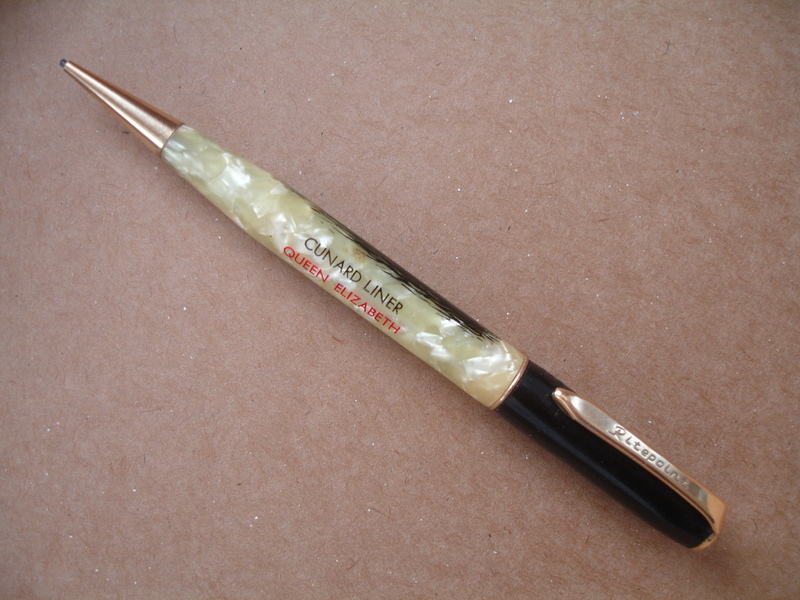 So many ladies' versions of pencils were made in diminutive, nicely decorated and exotically colored designs, something you would be happy to gaze on every time you went to make a list or write a note. 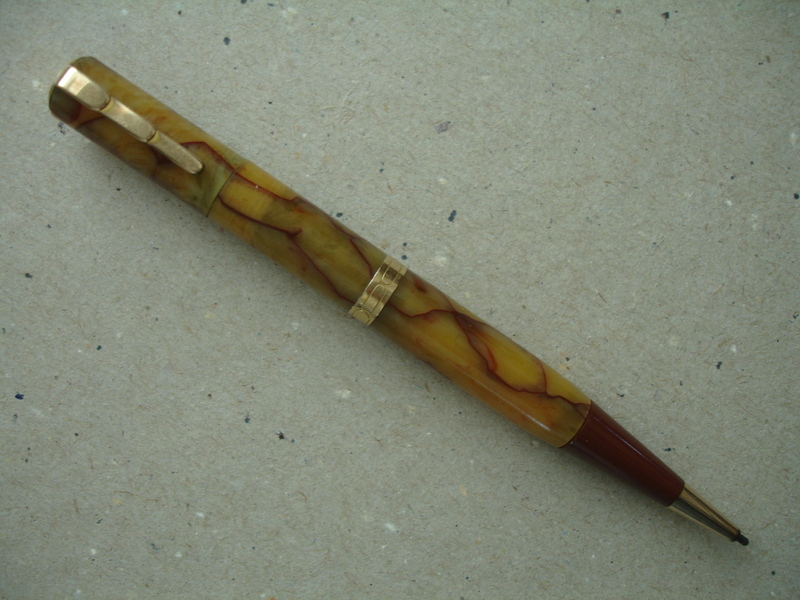 Above is an onyx celluloid Lady Patricia with ox-blood point made by the Waterman company in the 1930s. The design on the clip and around the center band reminds me of mermaid scales, or overlapping feathers. 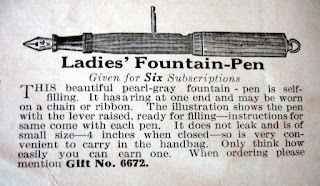 At 4 & 1/4 inches, it is one of the longer ladies' pencils. Only the imprint on the back has the Waterman name. Below you can see the washer-style clip and center band. The top screws off to reveal an eraser. 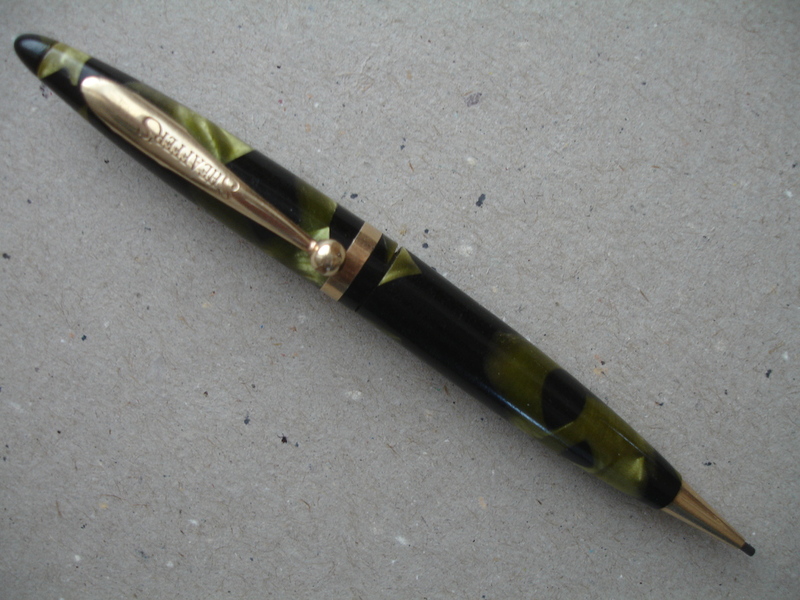 Another big name maker, Sheaffer, sold this petite green and black "marble" Balance at about the same time, and it is also 4 & 1/4 inches. This twist-mechanism Balance has a top which pulls off for access to the eraser. The Balance and the Lady Patricia use 1.1 mm lead. Which is more elegant? I can't decide. Here is a modest little unmarked pencil in cream "marble" with a black dot for a top jewel, a tiny Art Deco clip, and a simple center band. It has three rounds of "grip" to help you advance the lead with the nose-drive mechanism. It's as light as a feather to hold, and measures 4 inches. 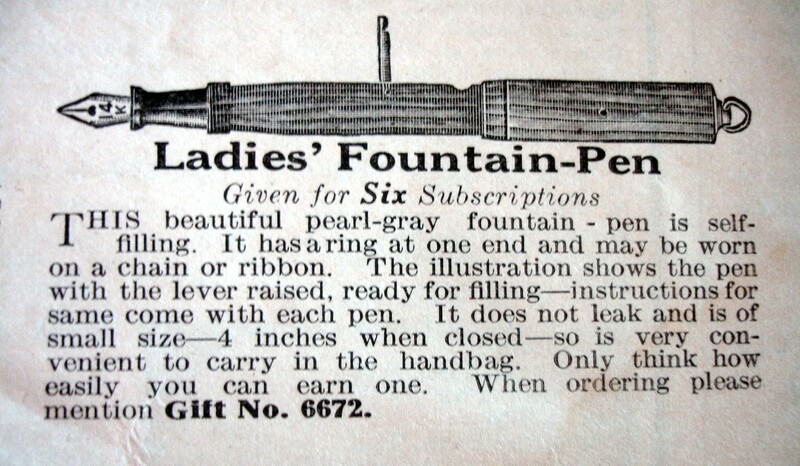 Finally, the smallest ladies' pencil is below. 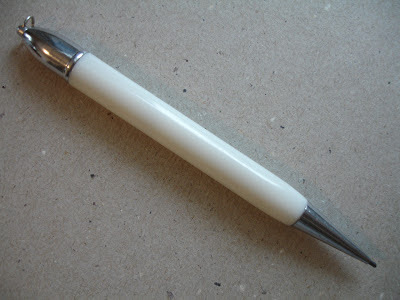 At 3 & 1/4 inches it is almost too small to write with comfortably, but so convenient to put in your pocket. The Salz "Peter Pan" in emerald "marble" also has a nose-drive mechanism, and a pierced-design center band which features on other Salz pencils. I sure hope they made this in red! I'll be cherishing these four favorites, and any other petite pencils that come my way. 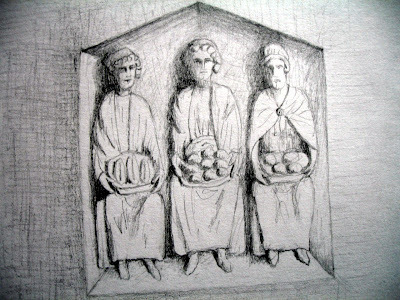 Pencil collectors, of whom I guess I am now one, can be swayed by sentiment as much as the next person. It's a minor failing that a clever dealer knows how to take advantage of when he or she spins a pretty tale about an item for sale. One auctioneer I know, when exhorting the crowd to bid higher on a couple of items, be they a pair of brass fire dogs or a mop and bucket, often pauses a second, and then assures everyone that "They've always been together." Yes, it would be a shame to part them now! Why not get both? Buy the lot, and the lot next to it! Okay, that's what I did. 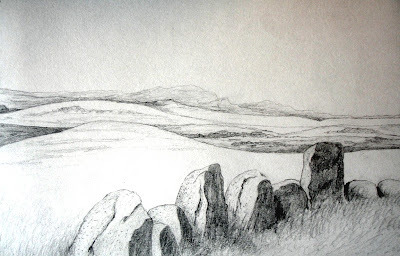 Yes, sentiment prevailed, and I bought a pen along with a pencil because they were always together, and in spite of the fact that a pen involves ink, and ink causes trouble. I like to think that it was also because they were beautiful, functional, well-loved by the previous owner, deserving of admiration and preservation, and a nice bargain to boot. 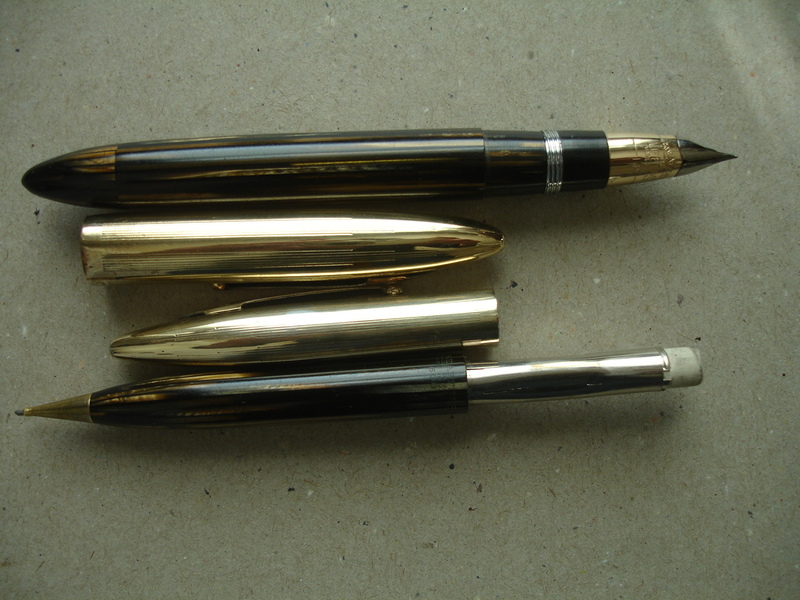 These are a Sheaffer WWII-era Triumph pen and pencil pair, with gold-filled caps, which makes them the "Crest" model. They have celluloid cases in a golden and brown striped pattern. 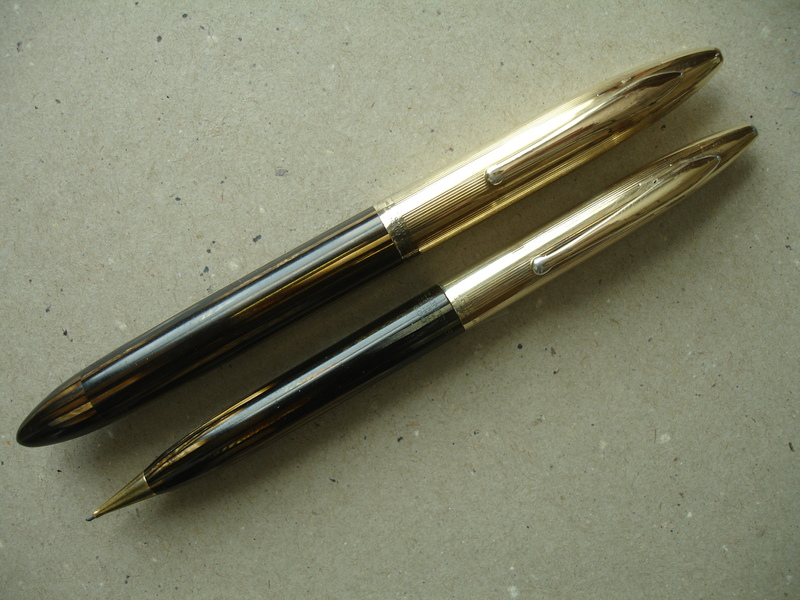 The pen is a Lifetime warranty model with a gold and stainless steel nib. 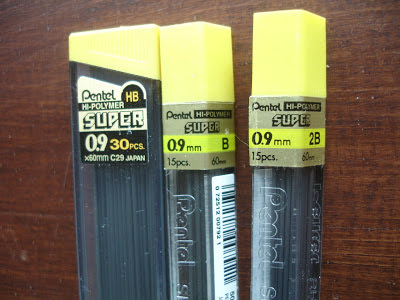 The pencil uses 0.9 lead, and cost $6.00 at the time. Imagine that, in about 1943! But you could use it for the rest of your life. They're a little worn and have a few small dings, but who doesn't, when they're 70? Otherwise, they're ready to go on writing for another 70 years. They'll stay together, old married couple that they are, as long as I have anything to say about it. Here are the happy couple in their retirement condo. In the mid-1950s my dad graduated from United Theological Seminary in Dayton, Ohio, and immediately went on a tour of Europe with his seminary choir to sing for audiences both large and small, and stay in local homes. 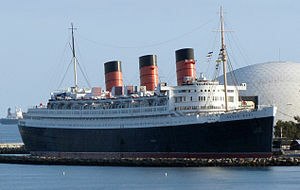 They sailed from New York on the Queen Elizabeth II ocean liner and returned on the Queen Mary. 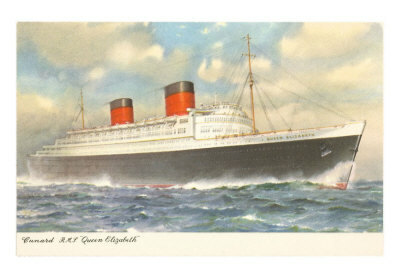 The choir performed to a full house on the Queen Elizabeth. 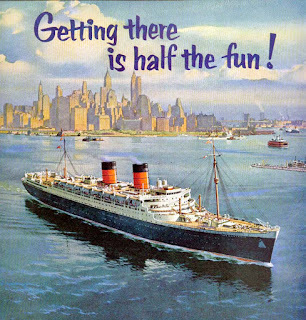 Years later, my sister and I reveled in looking through all the mementos of his trip in a trunk in the attic still labelled with the Cunard Lines stickers---five-course menus engraved on cream-colored placards, picture postcards of the Alps, guide booklets for famous cities and cathedrals, and photos of the host families and the choir members. It was great fun on a rainy day. To us it seemed by far the most elegant and interesting way to travel outside of a time machine! With Father's Day coming I faced the usual dilemma of a nice gift that Dad would really like, and for once I found the solution, a souvenir of a happy time, and a memorable trip--a pencil from the Queen Elizabeth. It's a Ritepoint, made in St. Louis, Missouri, and a little spiffier than their usual advertising pencils, as befitted the great lady. 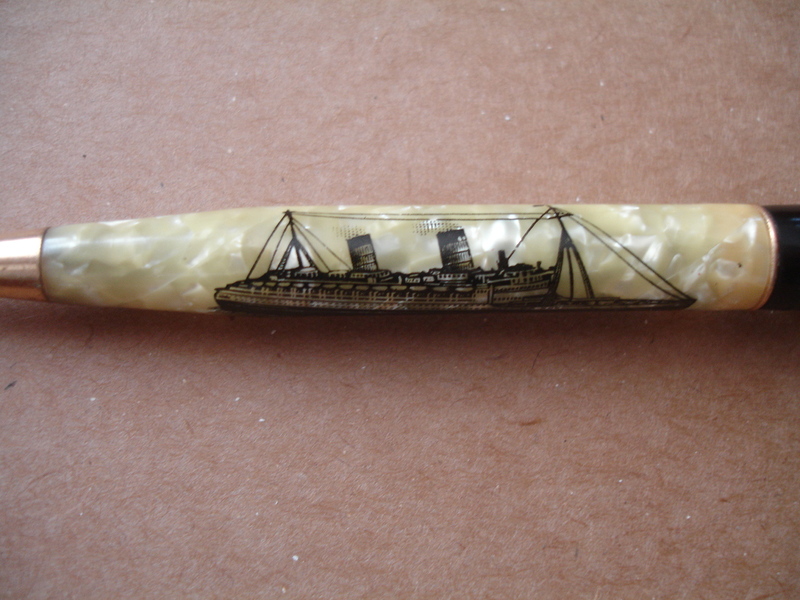 The twist pencil is imprinted with "Cunard Liner Queen Elizabeth," and an engraving-style representation of the ship, complete with smoke coming out of her stacks on the cream-colored "marble" center section. 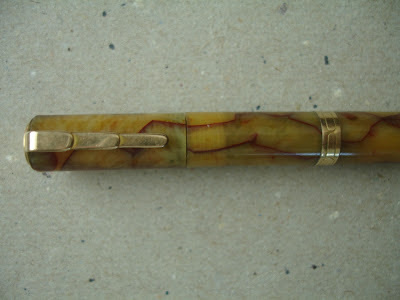 It has a black top with washer style clip and gold-tone "jewel," and gold-tone point with 1.1 mm lead. Extra lead is still in the barrel. 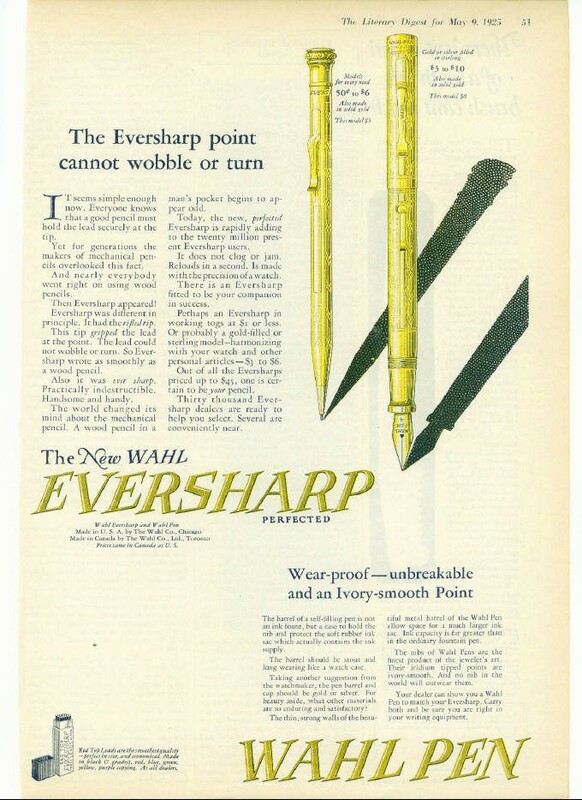 Going back in time, the Wahl "Ever Sharp" pencil, invented in 1913 and patented by Charles Keeran in 1915, could be seen as the starting point of 20th century mechanical pencils. The Wahl Eversharp company in Chicago made millions of metal pencils in that style, including this little silver plated ring-top. 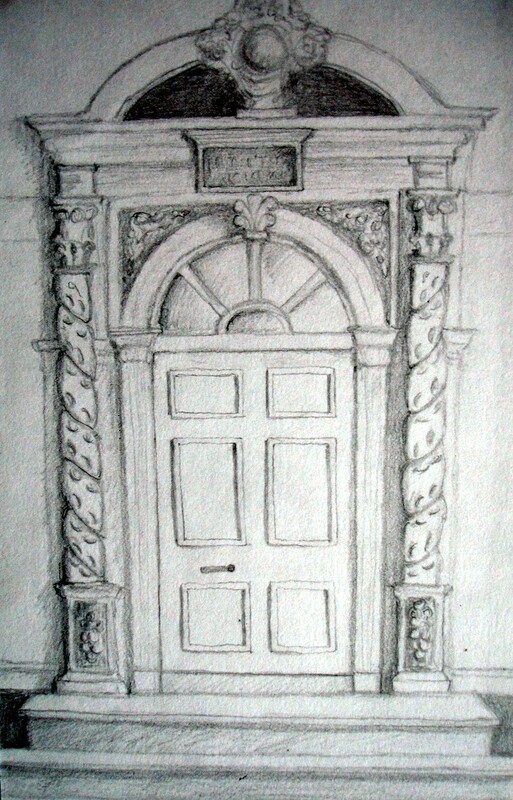 How elegant they were, with a top like the capital of a column, and a slim tapered point. This pencil could be as old as 1918, and has a soft patina. 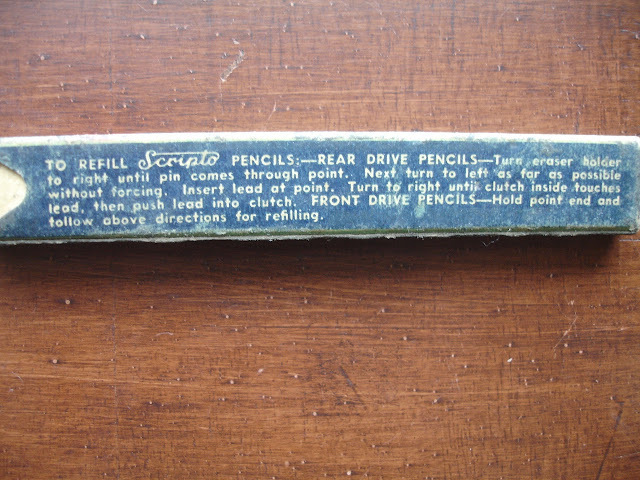 A little piece of pencil history. In this 1923 Wahl advertisement showing the clip version of the Eversharp Pencil (as well as Wahl's pen), it says that you could choose a gold or silver pencil (from one of thirty thousand dealers!) to match your watch, and other accessories. 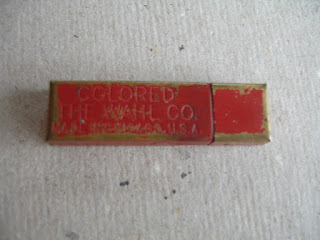 In the lower left corner of the ad you can see the Wahl Company's lead holder, which was made of brass and painted red. 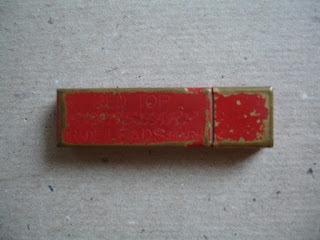 Some of the boxes had only the cap painted red. 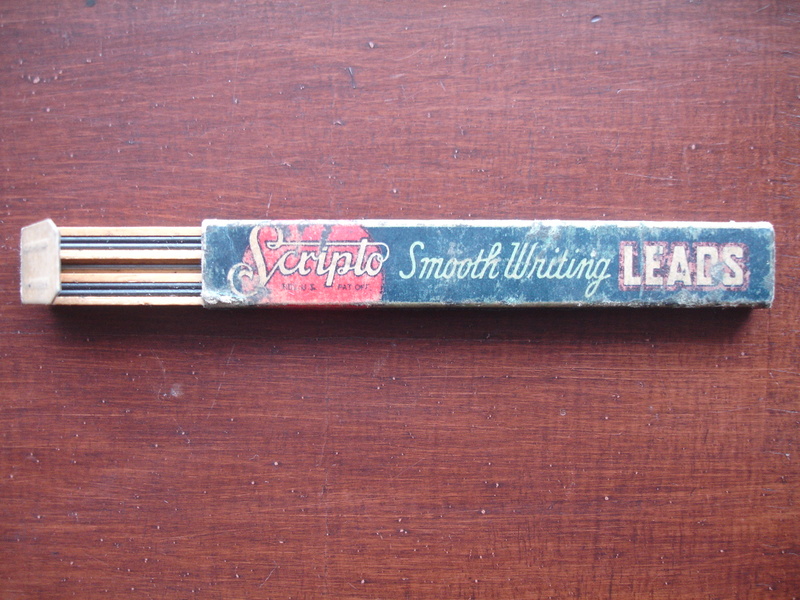 They were called "Red Top Eversharp Leads," and were also made in Chicago. The ad states that there were seven different varieties of black, as well as red, green, blue, and yellow. Also, you could purchase "copying purple." 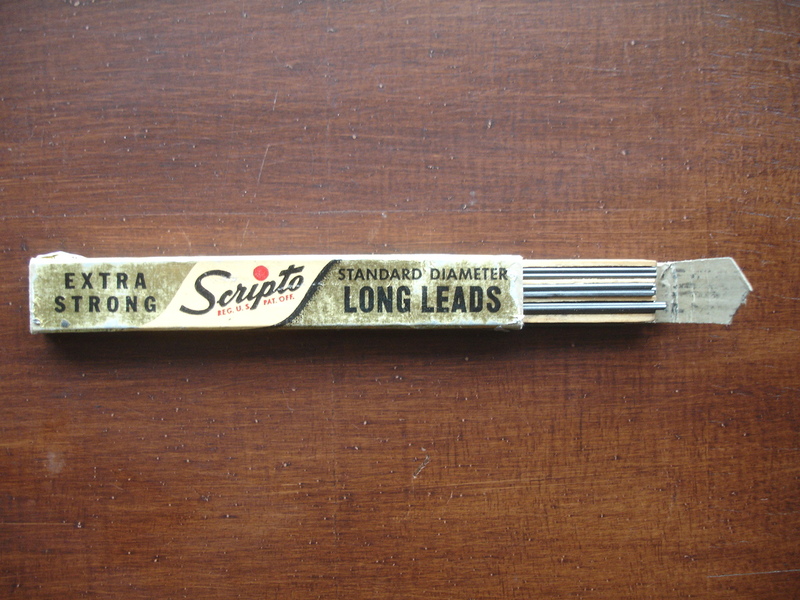 Copying lead allowed you to make a carbon (well, graphite) copy of your writing. This is the only metal box I have ever seen that has dovetail joints--one on each side of the box, and one on each side of the cap. I was happy to open the box and find red lead. 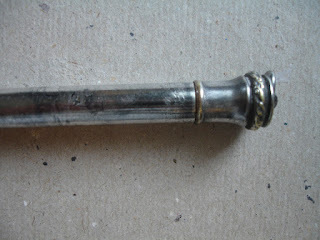 I do have a silver watch from the same era to match this silver pencil; it belonged to my great aunt, but it doesn't work anymore. The Wahl Eversharp pencil still does. 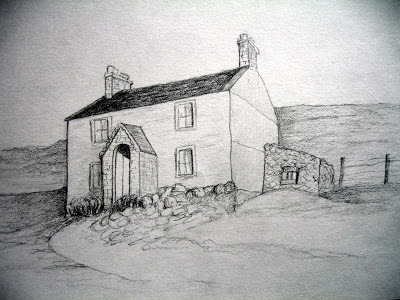 With mechanical pencils, it is all about two things, primarily, and neither is the actual graphite. First, it is about the mechanism. Without that it would not be a mechanical pencil. (My husband says I have a talent for stating the obvious.) Second, it is about the case, including the clip, if any, the trade name inscription, and the design, shape, and color (s) of the case or cylinder. 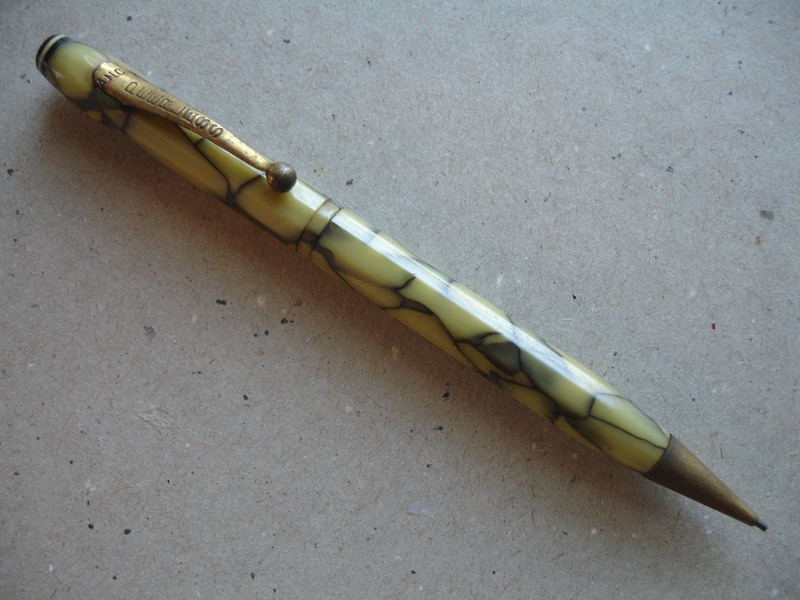 When the makers of mechanical pencils came up with an innovation in mechanics, they patented it, but the colors and patterns of the celluloid seem to have been up for grabs. 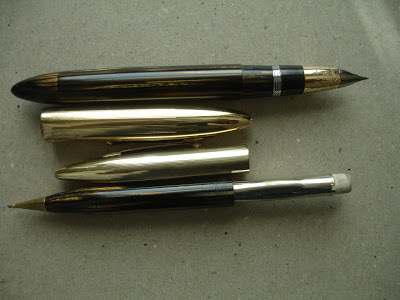 Pencil companies bought their case materials from manufacturers who sold the same celluloid to other companies as well. The first mechanical pencils had metallic cases, with the only decoration being patterns in the chasing --pretty subtle--so can you imagine the reaction when colored, patterned celluloid came along? This American News Company "Peerless" must have been an eye-popper! Or how about this little green "marble" pencil, called "Peter Pan," by the Salz Company of New York? On the other hand, if you like to sketch in pencil, the pencils are all about the type and quality of the graphite. My favorite sketching pencils don't even have a case or a mechanism--they're just sticks of pure graphite, with a little coating on the outside to keep your fingers from getting too black. 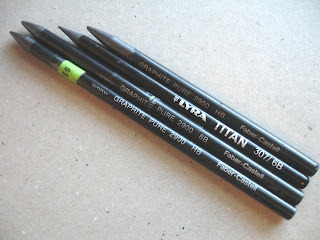 Since I like to sketch and I love mechanical pencils, it makes sense to me to hunt for lead that could work for both. 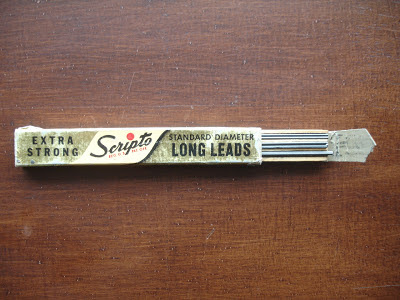 I'm going to give a few of these vintage leads a try. 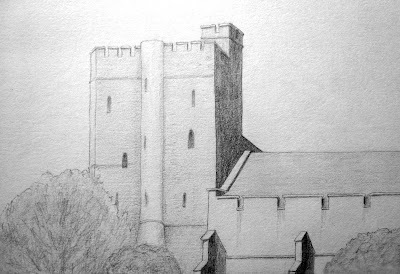 I wonder if there was ever sepia-colored lead for pencils? Or even just plain brown? As you see, I did find a little red.